Give full expression to all your senses, beginning with the pleasure of living on board a contemporary yacht with a totally innovative design. One does not need to be a great sailor to enjoy the happiness of life at sea and discover new horizons, sense is moving the boundaries of pleasure. From stem to stern, you will be surprised by the extremely well thought-out organisation of your life aboard with a sense of well-being, simplicity and beauty. 1. Exterior living with bathing platform, helm position and a cockpit width never seen before. 2. Daytime life in perfect harmony with the exterior: saloon and galley. 3. Life after dark at the forward end of the boat: bedrooms and bathrooms. BENETEAU have designed a low cockpit which radically alters life on board. Thanks to this real innovation, SENSE combines stretched and flowing lines with ease of access to the sea and the saloon. The ultra wide, spacious and safe cockpit is designed to accommodate sailors and guests in novel and distinctive spaces, free from the constraints normally generated by aft cabins. Under the cockpit there is still a technical area, which can be converted for use as an occasional cabin on the 50’ and over versions. The companionway is ultra convenient. The cockpit is separated from the saloon by just 3 steps raked at a 45° angle to provide safe and easy access, whilst everywhere the generously wide hand and safety rails ensure safety while moving about on board. A wide glass area and openings on both sides of the companionway promote a sense of harmony allowing life below and above deck to blend smoothly together. These choices confirm the hedonistic commitment of SENSE to provide increased levels of comfort for the owner and his guests. Additionally, all the systems, machines and deck equipment are brought together under the cockpit to ensure that noise is separated from the living area. 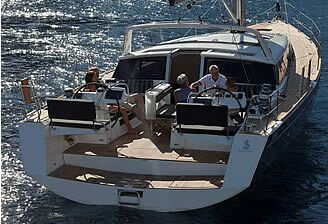 A boat that simplifies life on board On board SENSE, priority is given to the pleasure of being on the water. For the comfort of guests, the controls (winches, halyards, genoa sheets, etc.) are located aft of the ″relaxing″ cockpit area. The mainsheet is led back to a fixed arch which allows the companionway to be unrestricted. 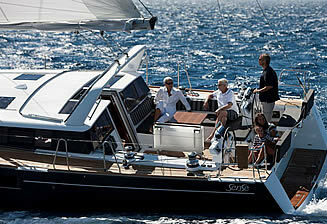 SENSE is designed for sailing with complete freedom with large fresh water and fuel capacities. It is also ready for renewable energy equipment (solar, wind). The SENSE is also suitable for tomorrow’s technology: hybrid propulsion, boat handling assistance. 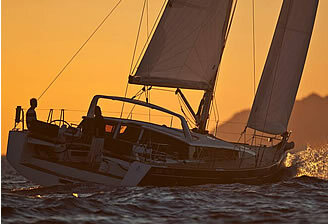 When cruising, comfort and therefore enjoyment also include comfort when sailing. The hull design has been created in collaboration with Berret Racoupeau Yacht Design, to deliver maximum performance with 15° heeling angle instead of the normal 20°. The advantage of this is clear - movement around the boat while sailing is safer and easier. The trio of BENETEAU, Nauta Design and Berret/Racoupeau together form a team of proven and complementary talents, who already have to their credit the complete renewal of the nine models of the OCEANIS range. The quality of the design being fundamental to the well-being of the crew, SENSE extends an invitation to view interiors that are elegant and contemporary in style. Gloss Alpi fruitwood finish, bleached oak laminated sole, "homestyle" upholstery, synthetic resin work surfaces with built in sinks and high-tech equipment have been selected with care in collaboration with the Nauta design studio. Certain items fold away when not in use such as the gas cooker, TV, seats, etc. SENSE: seaworthy boats which provide owners and their guests an exceptional quality of life on board.